This entry was posted in Forecasting and prediction, Risk management and tagged Executive time series, Process behaviour chart, Railways, risk management, Voice of the Process by anthonycutler. Bookmark the permalink. Another interesting and thought provoking article. 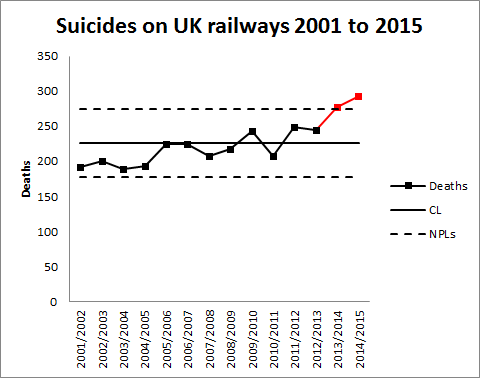 If you compare the ‘current year’ statistics with the historic data using the Poisson Distribution, then the number of fatalities in 2013 and 2014 appear to be significantly higher than would be expected due to random variations and ‘chance’. based on previous data. Although not conclusive evidence of a developing trend – this would suggest that ‘something has changed’ and that predictions based on historic data may be miss-leading. In this context, recognizing ‘trends’ may help identify underlying causes – or alert us to the the inaccuracies of predictions based on ‘old data’. To clarify my previous comment, I would use the historic data (average number of deaths/per year, to date) to predict the the range of values for the next year – and compare the actual data with that prediction. If the results are consistently above the 50% Poisson Prediction – or heavily skewed, is would support the argument that a trend exists – and should be investigated. 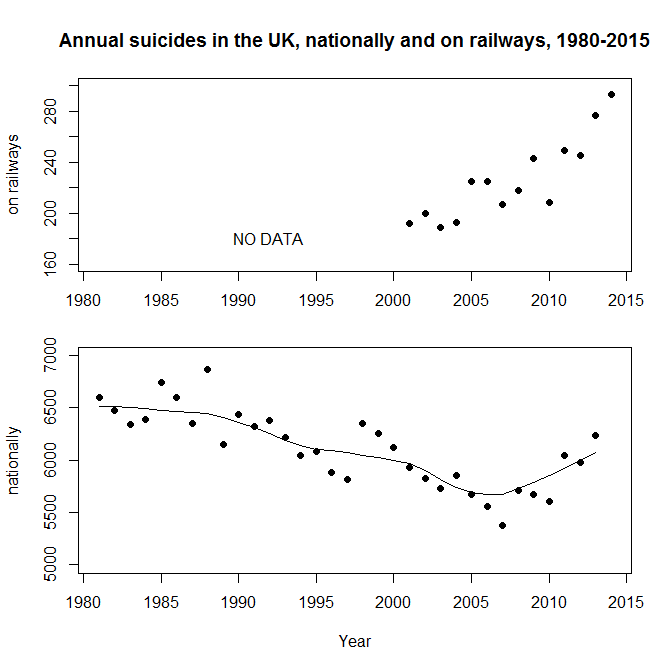 However, we may find a variety of patterns in the data, including long term trends due to improved design of stations and tracks or more effective surveillance, and cyclic variation based on social-economic factors.